In our last post here, Booty Quake put herself under the microscope, tracking her food intake for two weeks, and then I took her to task on not eating enough to support her athletic needs. You can check out Booty’s experience tracking her food, and my analysis in our Part One post. To summarize what we learned, Booty’s not eating enough to support her athletic lifestyle. Under-eating can be a super common problem for athletes, given that our caloric needs (and especially our carbohydrate and protein needs) go up as our training volume increases. So let’s take a look at what Booty has been eating, and figure out where she can make easy changes to add more protein and overall calories. If you’re interested in diving all the way in, you can check out Booty’s full day with all the ingredients and detailed nutritional breakdown. 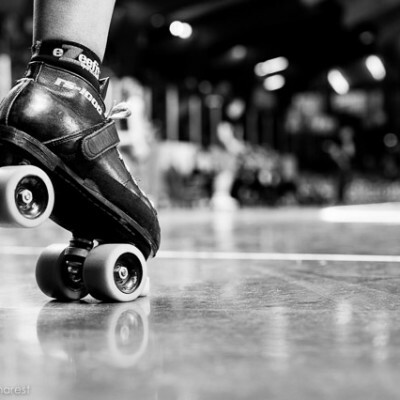 I picked this particular day to share with you because I frequently get two-a-day workouts in, with a strength workout in the morning and an on-skate derby practice in the evening. With practice 3 nights a week, I find I have to double up in order to keep up with my off-skate training program. It’s not every day, but it sheds light on what’s happening on my ‘worst-case’ day. 7am: Quick yogurt and granola + trail mix before a 90 minute gym workout (strength training and physio exercises). This wasn’t enough food – I was starving by the end of my workout! Exercise: my app estimates 683 calories burned. 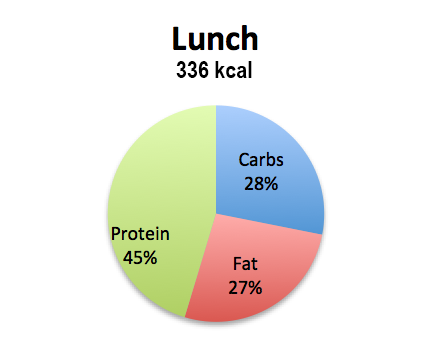 NoFair Says: The combined two mini-meals create your optimal nutrient balance. It can be tough for athletes to get enough protein when eating only three meals a day. Mini-meals allow you to double up the protein without feeling like you’re stuffing yourself (especially first thing in the morning). This is also an example of how tracking as you go can be a big help – If you starts entering your food and exercise as it happens, you’ll be better able to notice a morning like this where your workout completely offsets what you’ve eaten and you can try to add more food earlier in the day. 12:30pm: Lunch – A spinach salad with lots of veggies, and leftover sliced steak! Yum! Despite feeling really satisfied after this meal, when I look at the nutritional impact it seems surprisingly low in calories. Darn it! NoFair Says: I love a salad with meat on it! Yes, this lunch seems low-cal, but that’s because you can eat a metric ton of leafy greens and still not hit your calorie targets. 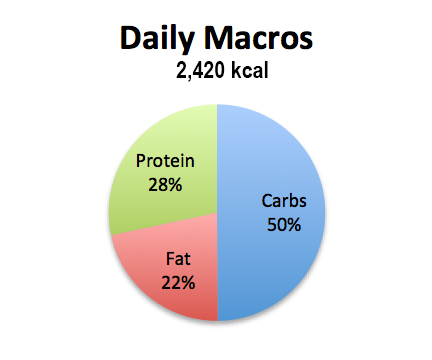 Try not to get too hung up on the total calories, as you can adjust your other meals to make up the difference. Rather, focus on how great the protein content of this meal was, and stop eating when you’re satisfied. 3pm: My morning workout has revved up my metabolism! Had a Quest bar mid-afternoon. Then had to snack again on crackers, a piece of cheese, and some hummus. 6pm: I ran out of time to prep proper food before practice! Ate a half peanut butter & honey sandwich on my way out the door as a last resort. Oops! 7pm: Three hour home team practice. Drank about 300 ml of apple juice + electrolytes mixed into my water bottle. 10pm: Post-practice – A slice of coconut-jalapeno paleo bread and carrots had me satisfied in the car ride home. Exercise: My app estimates 1136 calories burned. NoFair Says: The Quest bar is a good option on the go – as far as pre-made protein bars go, they’re pretty high-quality and free of most junk. Would have liked to see veggies included in the 3pm snack (and every snack and meal forever). I’d also like to see more of a focus on making sure to include a decent amount of lean protein with those other on-the-go meals. Peanut butter is alright, but pre-cooked chicken breasts for a can of tuna will give you a bigger protein bump with about the same amount of time commitment. Also, a pre-cooked chicken breast is a great in-the-car snack. 11pm: Back at home – Another salad with tons of veggies, plus turkey lunch meat added. Glass of wine, and dark chocolate, BECAUSE I’M WORTH IT. Unfortunately, when I look at my log, the wine and the chocolate provided over half of the calories in this meal (314 of 511). Another tell-tale sign that I need a post-practice meal makeover! That salad just isn’t cutting it. Looking back on the whole day, this was actually a relatively low fat day for me, compared to some of my others where I ended up with 45% or more calories from fat. 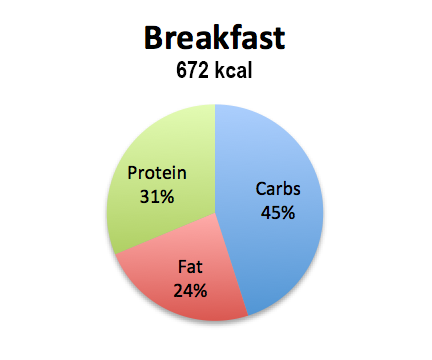 I was definitely hungry all day as a result of burning off my entire breakfast intake with my first workout. So that’s something I could really improve on. Plus my pre-practice meal was pretty lame! I felt really good about the hearty salads I made for lunch and late dinner, but they need to be powered up with more healthy calories to get me closer to my daily intake targets! NoFair Says: So, how can you eat more calories overall and not feel stuffed? More healthy fats and proteins. Fats have 9cal/gram and so can be a good way to bridge that calorie gap (provided you are making healthy choices). For example – toss some nuts, seeds or avocados on that delicious salad. Have nuts or seeds to snack on along with your veggies and protein snacks. Another good strategy (that we mentioned at breakfast) was to break meals up into mini-meals and frequent snacks. 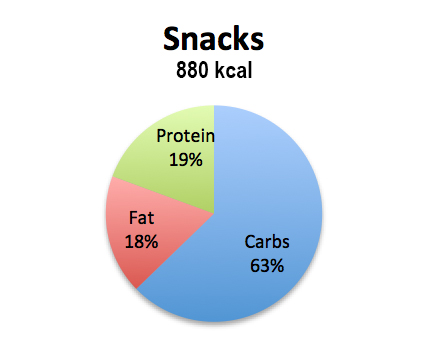 Aiming for 6 300cal meals (and some snacks) can seem more achievable to some folks than 3 600cal meals (plus snacks). **note: this was the target Booty was operating on as guided by her MyFitnessPal app. In Part One I advise that going forward her daily target intake should actually be between 1800-2100 calories. 4 oz. Eye of Round Steak, sliced, on top. This recipe assumes you were lucky enough to have steak for dinner the night before. Just make extras, and then slice one onto this hearty salad for your lunch the next day! Mind the portion sizes – remember that a four ounce serving of meat is about the size of a deck of cards or the palm of your hand. NoFair Says: To add some extra healthy fats to this meal and give it a calorie boost (since it weighs in at just 336 kcal), Booty could add some chopped avocado, toasted nuts, or even flax seeds to the mix!